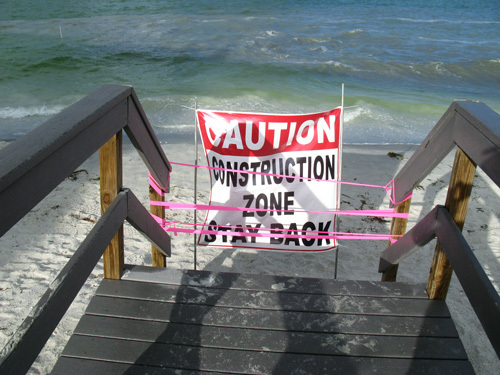 The Treasure Island Beach Renourishment project is underway on Sunshine Beach. 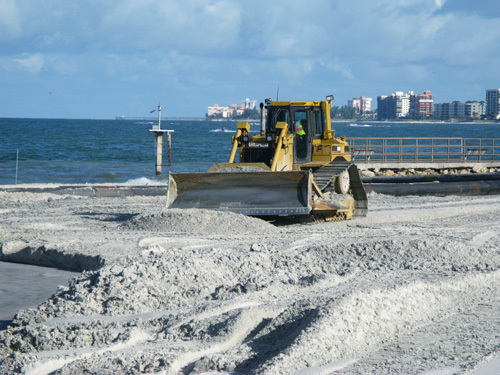 Beach renourishment is utilized to counteract the effects of storm and erosion on the coastline. This joint effort, between Pinellas County and the U.S. Army Corps of Engineers, will renourish the beaches both here and down on Sunset Beach. 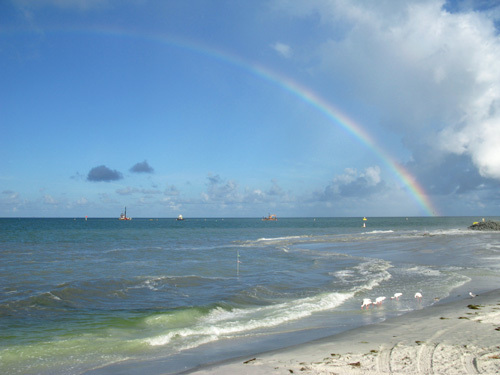 Sand will be dredged from the John's Pass channel on the north end and Blind Pass to the south. 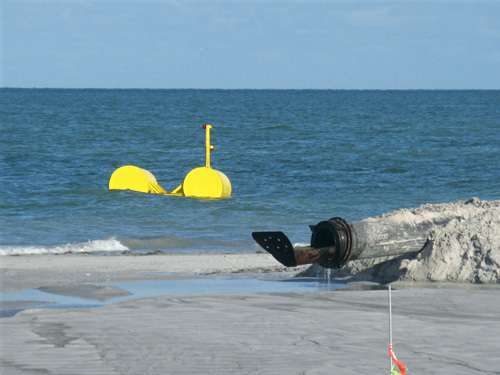 The dredged sand will be pumped though huge flexible pipes back to the beach where it is expelled to form a "new beach." The sand is allowed to dry and is then graded down by bulldozers. 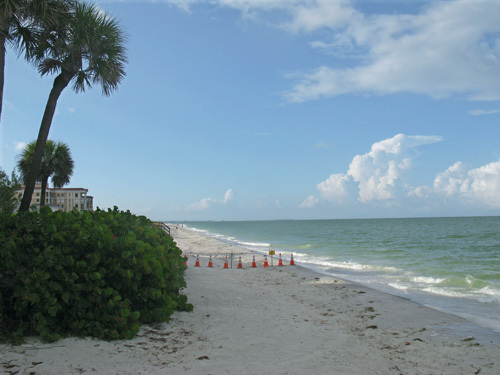 During the month of August (2010), the Sunshine Beach between 127th Avenue and 120th Avenue will be renourished. 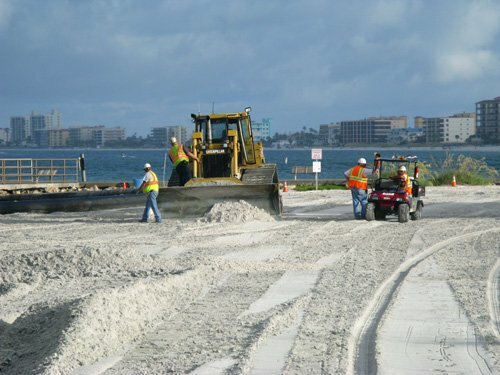 Work will start on Sunset Beach, between 88th Avenue and 77th Avenue in September, 2010. 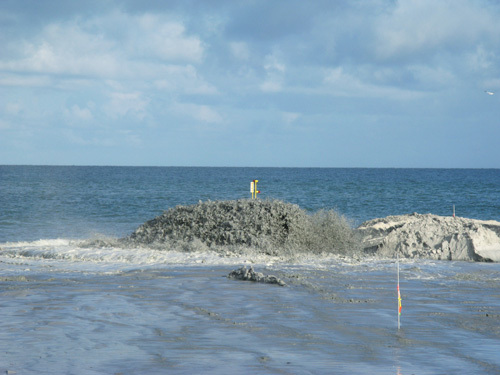 You can read the specifics of this beach renourishment project for Treasure Island and learn more about this interesting method of countering erosion. 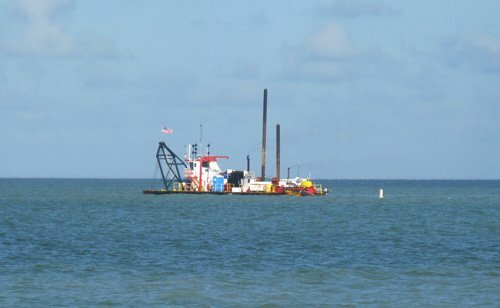 A barge with heavy dredging equipment sets up in the John's Pass channel about 300 yards off shore. 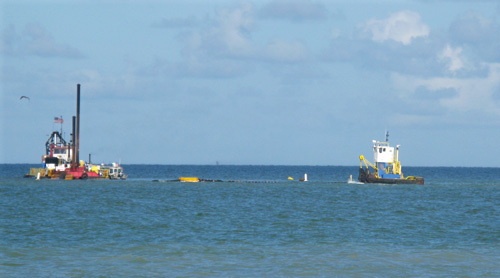 A small tugboat is used to push the dredging barge to different areas of the channel. 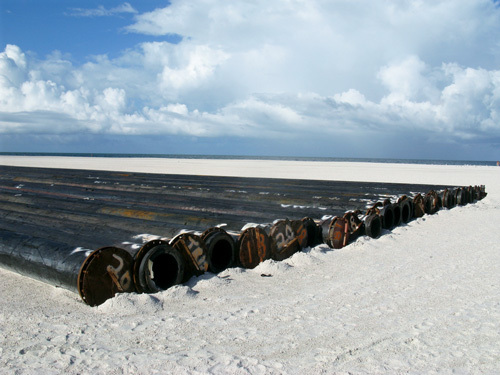 These large flexible pipes are connected from the barge back to a belching flow pipe right on Sunshine Beach. Here is what the belching pipe looks like when the flow of sand is turned off. It runs pretty much continuously throughout the day. It is quite a bit different when it is pumping out sand from the bottom of the Gulf to build up Sunshine Beach. When the sand dries, it is graded down with a bulldozer to blend in with the beach that had survived storms and erosion. The dune walkovers, like this one at Snowy Egret parking lot at 126th Avenue, are barricaded to protect beach goers from the dangerous equipment and activity. Pylons and signs also cordon off Sunshine Beach from foot-traffic into the renourishment area. 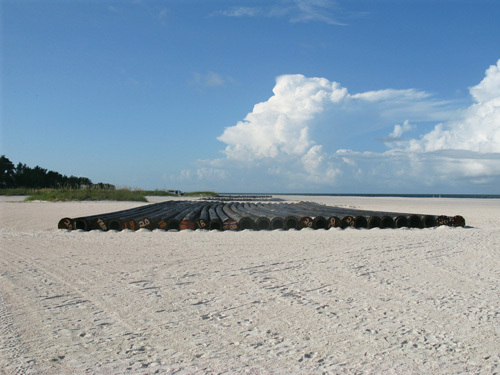 About a mile south, at the Gulf View Park beach access, hundreds of flexible pipes are laid out for use on the Sunset Beach phase to begin in September. While I was here, a rainbow appeared after a light rain. We all hope this is an omen for success in keeping beach erosion in check. The Treasure Island Beach Renourishment project seems to be moving quickly. I will give you an update when the Sunset Beach phase begins next month.